No to ego and attitude. Yes to passion and skills. A passionate recreational boxer, Deniz graduated from Roehampton University with a B.A. in English Literature, where he gained experience as an assistant coach at the University Boxing Club. Deniz began his coaching career at Total Boxer as an apprentice in 2013, working closely with club founder, Matt Garcia. He quickly proved himself a valuable asset through their shared passion for the science of boxing and the art of coaching it in a friendly and effective manner. Later that year BoxingYoga™ was launched and Deniz committed himself to practicing it every day for 30 days. Seduced by the benefits of the program, he continued his yoga studies to eventually become an excellent BoxingYoga™ Coach and key contributor to the BoxingYoga™ Teacher Training course - leading to licensed coaches in 24 countries worldwide as of September 2018. A certified England Boxing Level 1 coach, in 2015 Deniz became Total Boxer Head Coach, mentoring new club coaches as well as sharing his knowledge and expertise throughout the week with Personal Training, Get FIT Not HIT® and BoxingYoga™ classes. A huge boxing fan, 'SteveO' comes from a fighting family; his dad was a successful amateur, competing all over Europe, and his twin brother, a Mixed Martial Arts specialist. SteveO has been boxing since he was a youngster and became a Total Boxer member in 2013. His enthusiasm for the sport and helping others led to his invitation to become a member of the coaching squad, under the guidance of Matt and Deniz. Since then SteveO has gone from strength to strength. He has completed both Advanced and Elite Instructor courses at the Ricky Hatton Academy, as well as being awarded an England Level 1 coaching badge. Specialising in layering padwork combinations and innovative bag circuits, SteveO is an ever popular club coach who loves seeing the progress made by our members each week at his regular Get FIT Not HIT® classes and Personal Training sessions. Katarina has always been a sports, dance and fitness fanatic. After achieving her Anatomy & Physiology for Exercise and ETM qualifications she became a Pole Fitness Instructor and in 2014 was voted the 3rd best Pole Dance Instructor in the UK. Even though Katarina is also qualified as a Circuit & Indoor Cycling Instructor, she still felt something missing. Since being recommended to try BoxingYoga™, the rest is history. Bobby's love of boxing started with the golden age of British boxing, mesmerised by fighters such as Lennox Lewis, Naseem Hamed and Ricky Hatton. A lifelong passion for fitness, nutrition and a keen footballer, it wasn't until Bobby started training at Total Boxer in 2014 that his boxing skills emerged and he found his calling. "I've watched boxing all my life and it was at Total Boxer where I fell in love with the training itself. I became obsessed; working out 3-4 times a week, getting seriously fit and learning the true craft of boxing. When Matt invited me to become an apprentice coach I jumped at the chance." During his two-year apprenticeship Bobby's natural coaching style and passion for boxing became evident. He even spent a few months at the world famous Mendez boxing club in New York to get experience working with professional fighters. By 2016 Bobby successfully completed his Total Boxer coaching apprenticeship and in 2017 qualified as an England Boxing Level 1 coach. Yvette was one of the first people through the doors when Total Boxer opened in 2012. With a fierce love of combat sport, she has practiced and taught kickboxing to adults and children for 8 years, and managed a Martial Arts club, as well as training in boxing, Mixed Martial Arts, Brazilian Jiu Jitsu and Filipino Martial Arts. Yvette has recently completed a PhD in Archaeology and joins the Total Boxer team offering Personal Training sessions in light contact boxing sparring for women, kickboxing, and general fitness and conditioning. Yvette's particular passion is teaching women how to spar as a means of building confidence, self-defence, and self-expression. An experienced boxing coach and martial artist, Anil brings a wealth of knowledge and passion to Total Boxer. A 1st Degree Black belt in Jeet Kune Do and Kali, Anil was a regular instructor at the prestigious academies of Bob Breen and London Wing Chun. He is also a student of the Legacy Gym Boracay in the Philippines and is accomplished in boxing coaching, cornering and competition. 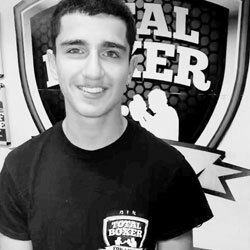 Passionate about the development of his students and a qualified England Boxing Level 1 coach, Anil takes great pride in leading our advanced FightReady™ boxing classes and is available for Personal Training sessions. A freelance photographer for over fifteen years, Amanda is naturally active and likes to challenge herself in all areas. A keen runner, in 2015 she completed her first marathon, just for fun! 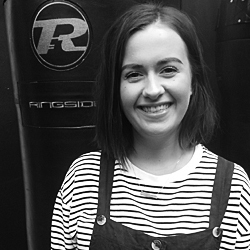 Amanda first came to Total Boxer via a chance meeting with club founder, Matt, in the summer of 2013, "he was banging-on about this thing called, BoxingYoga™, so I decided to give it a bash". Quickly captivated by it, she became a regular to classes and after a couple of years, despite ever contemplating becoming a BoxingYoga™ Coach, she was encouraged to think about it. 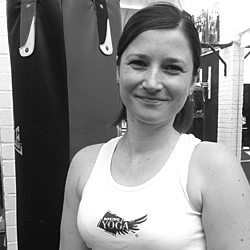 In June 2016 Amanda took the plunge and successfully completed the BoxingYoga™ Teacher Training course with flying colours to become a fully qualified BoxingYoga™ Coach. Amanda was immediately welcomed to the Total Boxer coaching staff and is excited by the opportunity of sharing her learning with others. Here is a guy that eats, sleeps and lives boxing. He first laced-up his gloves at 13 years old in his native Italy and fell in love with the sport immediately. At 17 he began his amateur career with legendary coach Salvo Cannato guiding him through a total of 34 bouts, some against Italian golden glove champions and national belt contenders. With his Personal Training and boxing coach badges, Angelo arrived in London to join the Total Boxer coaching staff, determined to become the "best boxing coach in the business, at the best club." "I came to London, to Total Boxer, to put my name in boxing history. Boxing is my passion, my love, my dream and my obsession - I give all these emotions to my students. It's not easy training with me, because if you want results you must work hard. But I promise all my students, you'll love boxing with me. There is nothing better than to do and teach something you love!". Liz is an ex-amateur boxer who boxed for London and joined Total Boxer in 2017 where she met Matt who helped her get back to fighting fitness after an injury. Liz has 17 years of extensive industry experience delivering more than 10,000 hours as a personal trainer and strength coach in a number of world class gyms. A former co-owner of London’s City Strongman and The Foundry Liz introduced Modified Strongman Training to Total Boxer as part of developing our strength and conditioning programme. Roy’s first love is running, which saw him represent his school, city and county as a teenager. He became a fitness professional when he joined the industry in 1998 as a Personal Trainer in his home city of Portsmouth before moving to London in 2000. As a lifelong boxing fan, Roy began his boxing training on the south coast and became a Total Boxer member in 2014 where he continued his training under the guidance of Matt and Deniz. Inspired to embark on a career in boxing coaching, Roy successfully qualified as an England Level 2 Boxing Coach in 2019. He is also qualified to deliver the National Boxing Awards Programme which is aimed at teaching children boxing skills in a safe and fun environment. 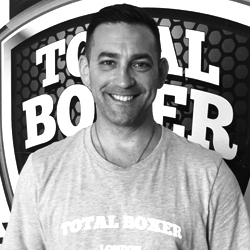 At Total Boxer you will find Roy assisting throughout the week at our Amateur Boxing Club. 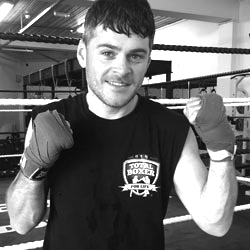 Hornsey local, Calum joined Total Boxer in 2017 to experience a sport he has loved his whole life, inspired by favourites Sugar Ray Leonard and Anthony Joshua. With enthusiasm to build his boxing knowledge and help those around him, Calum was invited to join the coaching team as an apprentice and has since taken the opportunity with both hands. Jemma is the voice on the phone, the words on email and the love of our lives; providing the back-office and front-desk support required to keep things running smoothly behind the scenes and engaging on reception. A Crouch End local and keen yogi, Jemma took her degree in American Studies, specialising in Motown and Civil Rights. Creative in the kitchen and with an interest in interior design, Jemma can most often be found tempting the office with culinary delights or rearranging the furniture. 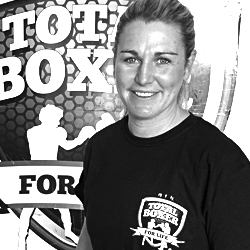 One of the first people through the door when Total Boxer® opened in 2012, Sarah is a fitness enthusiast, lover of boxing training (obviously) and keen runner. A born and bred North Londoner and long time Crouch Ender, Sarah also happens to be a community and events specialist. So when Matt reached out to her and suggested working together to help Total Boxer® with our many community initiatives, she jumped at the chance! Junior is one of those coaches you love to have in your team. Friendly, enthusiastic, intelligent and relaxed, Junior is a popular member of the crew and can often be found curled-up on his He-Man bedding or chewing his favourite toy outside. Ever the considerate hound, Junior is no trouble if you have any issues with dogs. He rarely barks, never jumps, doesn't get in the way and has a remarkably calming effect, whatever your doggy sensibilities.